so our Christmas decorations are now put away for another year. and will be for much longer! and it's been 9 degrees the last few days. It's supposed to warm up again soon, but it is still WINTER! I absolutely adore winter, and hope we get lots more of it. full of frosty whites and shimmery silvers and minty greens. 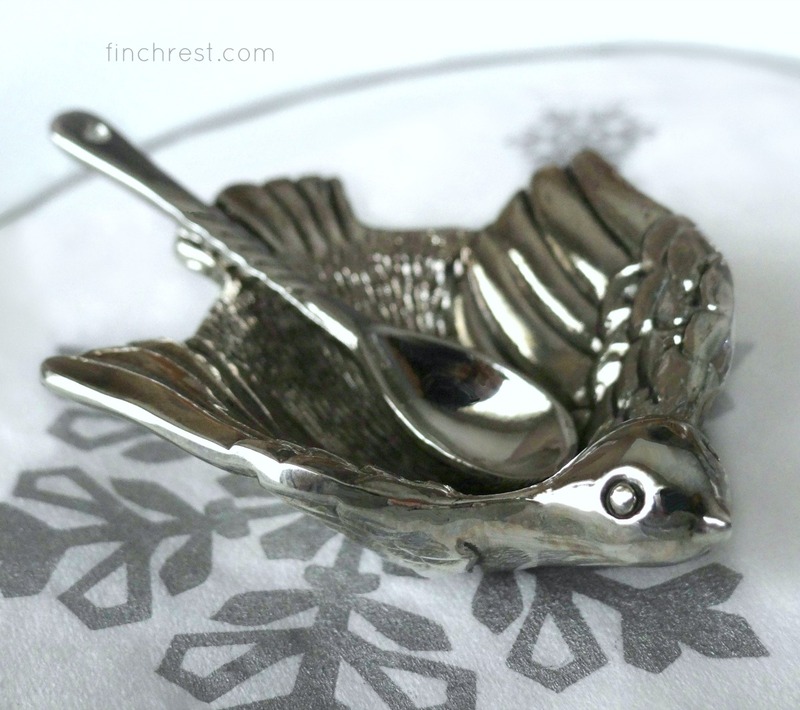 I love this tiny bird salt cellar my friend & tea sister Dawn gifted me. It's quite at home nestled among the winter decor around here. until I feel I have a handle on my decor. I guess that is my true New Year's Resolution. I REALLY need to get more organized! my dear mother-in-law recently gifted me. one can always tell she puts a lot of thought into her gift-giving. Isn't it just delightful? It's hard to believe it is an ornament! 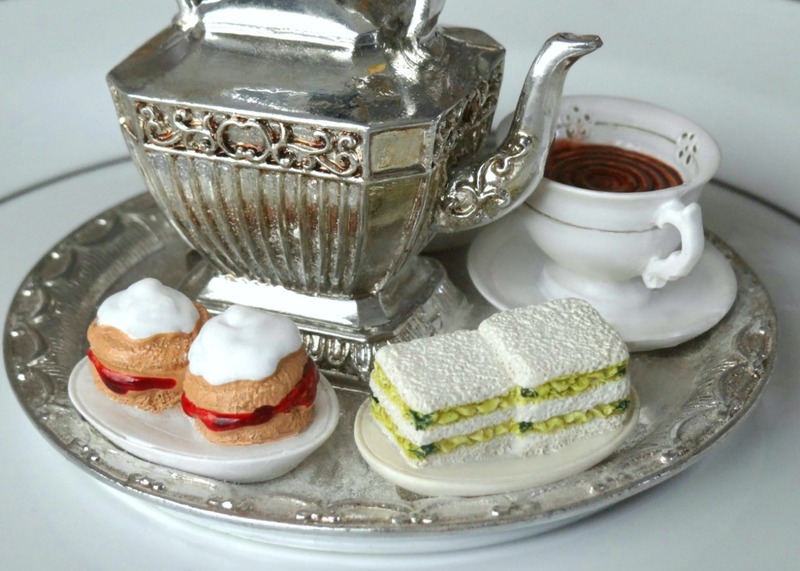 Silver tray with perfect tea-time-for-two delights? I believe she knows me well. Yes, winter looks splendid in all its shimmery white finery! on display around our nest. I only wish I could paint like this! wherever you happen to nest! 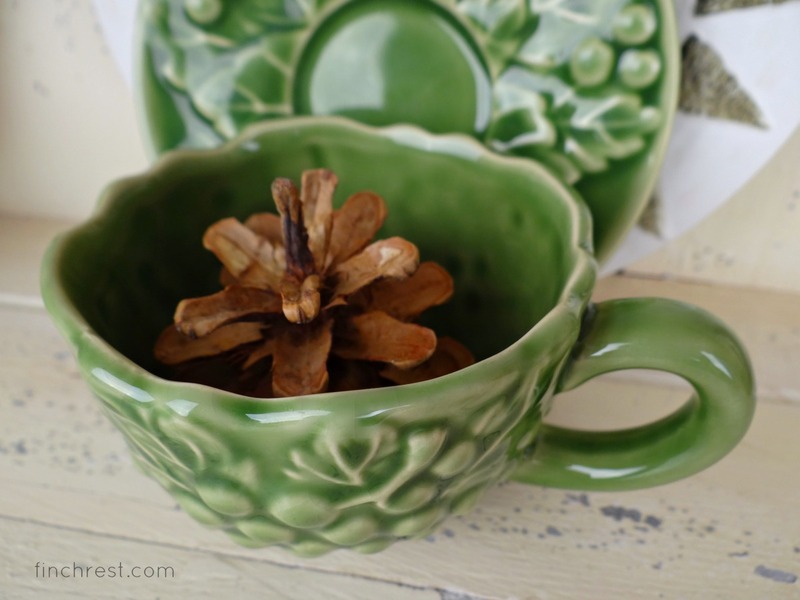 Love your pinecone tea cup collection. Happy winter! Adorable. I love the snowflake napkin in the teacup. So pretty. Michele, your little Scrabble tiles look so pretty in the silver dish. Your purging is very inspiring. We are in a rent house right now with most of our belongings in boxes. This has really made us realize the need to get rid of some things. Beautiful! and that waterlogue pic is gorgeous!! I'm also a DA fan so I'm loving the pretty ornament that your MIL gifted you. I put my Christmas decorations away last weekend. Trying to fit everything in the tiny basement closet--which also houses my extra teawares--was like playing Tetris! I realized that I need to do some SERIOUS downsizing of my collection of teawares. So that will be one of my goals for 2017...Now I'll just have to ogle the tea pretties of my blogging friends! What a lovely post - and I'm so glad you enjoy winter - I want everyone to enjoy every season - they are going to come whether we enjoy them or not - and so I figure I should enjoy them when I can. We are having heavy rain in the Pacific NOrthwest - very common here - and very welcome. 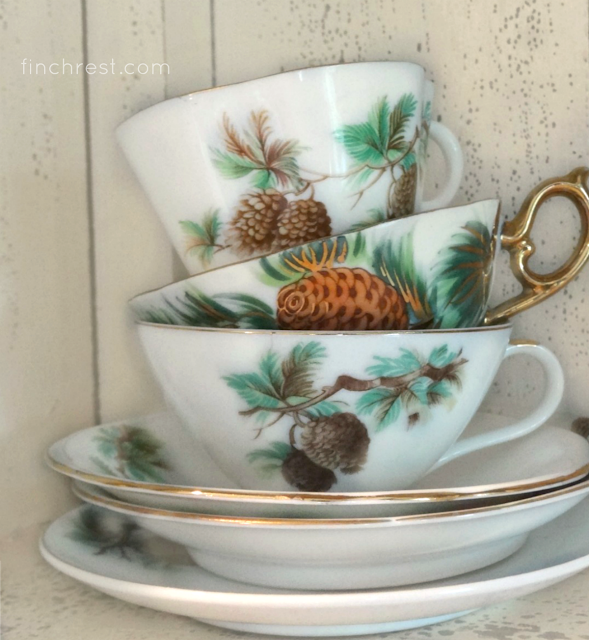 Love love love your decorations and you pine cone teacups - great idea to display them. You and me, girlie! I have a whole box of stuff to donate, too, as I continue to downsize and purge that which is not necessary to my 'happy' space. I like the glitzy part of winter long after Christmas is packed away, too. It makes me feel good to have a bit of sparkle to see me through the cold winter months. I LOVE those pinecone cups. Who makes them? I just love them and they are a perfect segue from Christmas to winter. Beautiful post - love all your pretties. I have all the Christmas decorations down and the house feels bare. Hoping you are fine and having a ball with your beautiful granddaughter. Love that special ornament from your MIL. Really sweet. I signed up for email notice when you post. I won't miss your posts this way. Have a great new week ahead. A beautiful winter themed tea. That ornament from your dear MIL is quite unique. I would want to leave it out on a regular basis. Over the last few years I have down sized my Christmas ornaments and decorations. It's amazing how much you can accumulate over the years. Some of it went to my daughters. So good to hear you also adore Winter!! I so look forward to this time. It is so bright and clean, love the bare trees and bushes, such beautiful sculpture. And the air is so fresh and breathable!!! Love your tea cups and the artsy watercolor!!! Most of the holiday décor is put away, but not all......I need that color!!! I'm on the same page with you, Michelle...clearing out decorations for every holiday and season and donating them Excess seems so unlike the way I'm feeling now. I love your pretty dishes for this elegant tea. I like that you take the time in making beautiful treats to share with your tea. What a lovely way to continue celebrating winter with all of your delightful objects. The Downtown ornament is super, I have to find one of those for my tree next year. Love your pinecone china, another lovely seasonal touch. Thanks for your company for Mosaic Monday this week, Maggie. Oh so pretty, that salt dish is amazing and what a perfect gift from our MIL. Oh, Michele, glad that I stopped by as I found something wonderful to snag for my folder. That DAbbey ornament is adorable! I like your winter sensibilities. I am no fan of winter as you are. Sure would make life easier if I were. Michele you are a lucky lady! I love that ornament from your MIL. You always have a nice way of saying things and a good perspective on life. Each year I work to embrace winter because I have no choice and it's easier to embrace than resist especially since I live in a snow belt! There is much beauty to be found with the snow laden landscape and that's my focus. Your pine cone china collection is wonderful. Have a great week! Hello, my sweetness! Oh, what a lovely post! I adore that darling DA ornament! It does look so life like and to boot it's so lovely. 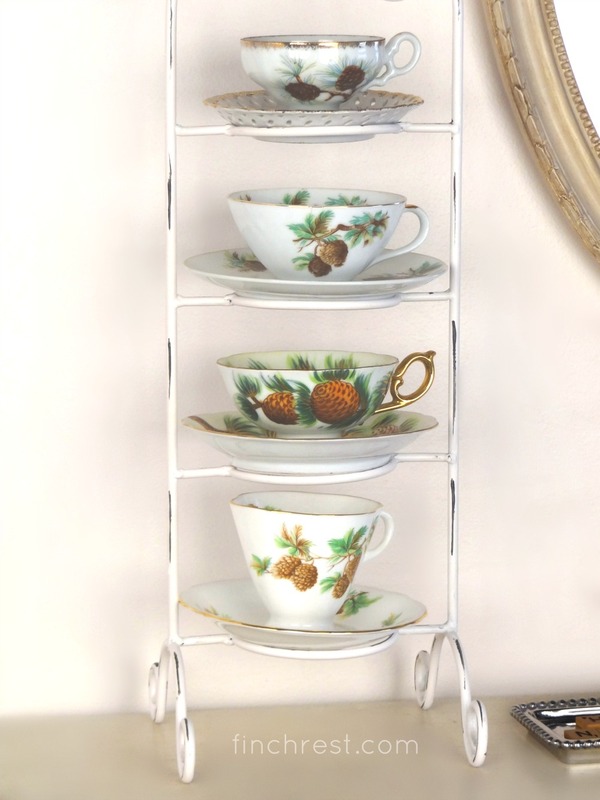 I adore your pretty pine cone tea cups and your tea cup stand. I know it's hard to purge our pretties and it would probably be especially hard at your house since you have so many beautiful things! If I lived close I could take some off your dainty little hands! :) Thanks for popping in to see me. 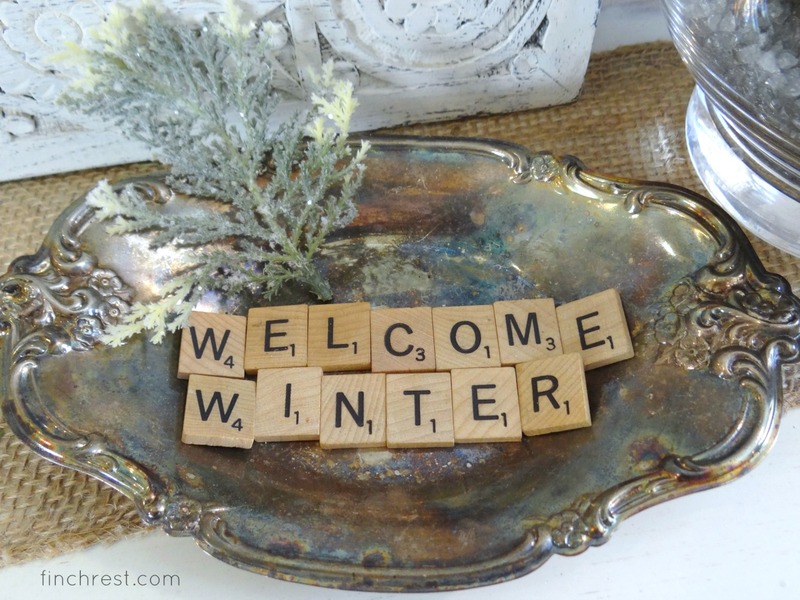 This is such a beautiful post, Michelle and your winter decor is just gorgeous. 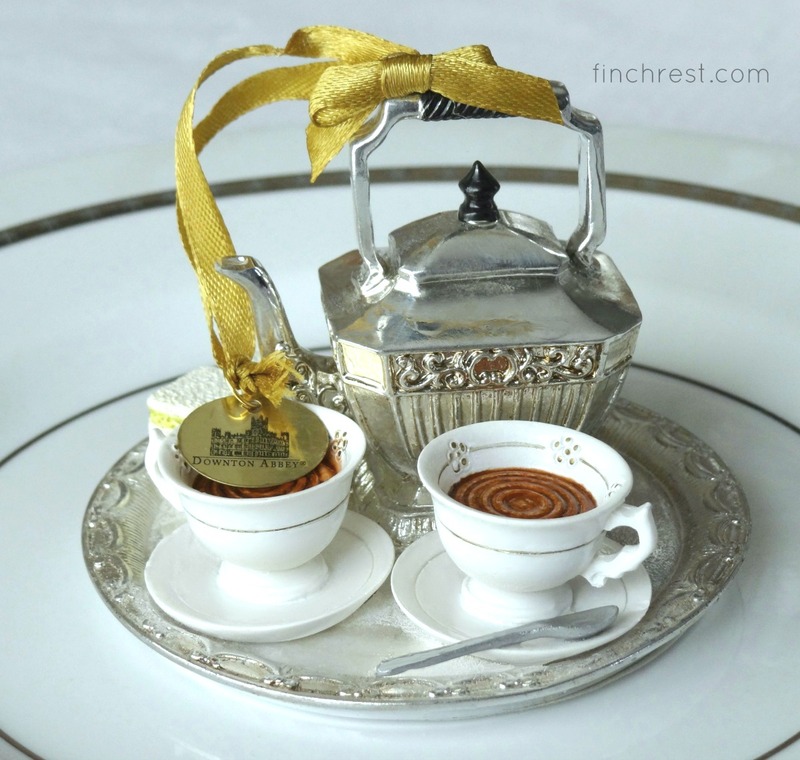 Those tea ornaments are simply amazing and your collection of pine cone teacups are stunning. Don't you just love the Waterlogue app? Enjoy your winter days ahead! Blessings! Like you, I love winter...the crisp cold, snow (only wish we'd get more of it). You have such a pretty collection of teacups to showcase this time of year. Love all your teacups, Michele. Your décor is always so perfect. We've had temps of 20 degrees but it is warming up some, thankful for that. Your decor is gorgeous Michelle....I love the game pieces in the first pic! Great idea!!! What a lovely post, my friend. Your pictures made my heart sing. And oh, that little bird from your tea friend is just precious! Wshing you a joyous and blessed week. Love and hugs! We Ohioans do know how to make the best of Winter, don't we? LOL! Up here on Lake Erie, we already have several Ice Events (usually involving Ice Sculptures)planned in different communities. And Public Square in Cleveland has an ice rink open all season (just like NYC). It's really a lovely time of year, if you just know HOW to enjoy! Love seeing your pretty tea cups with the pine cones. . .very unusual! And the DA ornament is so cool; I'll have to look for that. Have a great day, Michelle, and thank you for sharing your beautiful thoughts and images. Your MIL really does know you! Wonderful ornament. Love your teacups with the pine cones. Enjoy your winter! Happy New Year! I love winter too and keeping decor of snowflakes and snowmen out until the end of March. Your MIL bought you a lovely DA gift and I love all of the pinecone teacups - glad you display them. 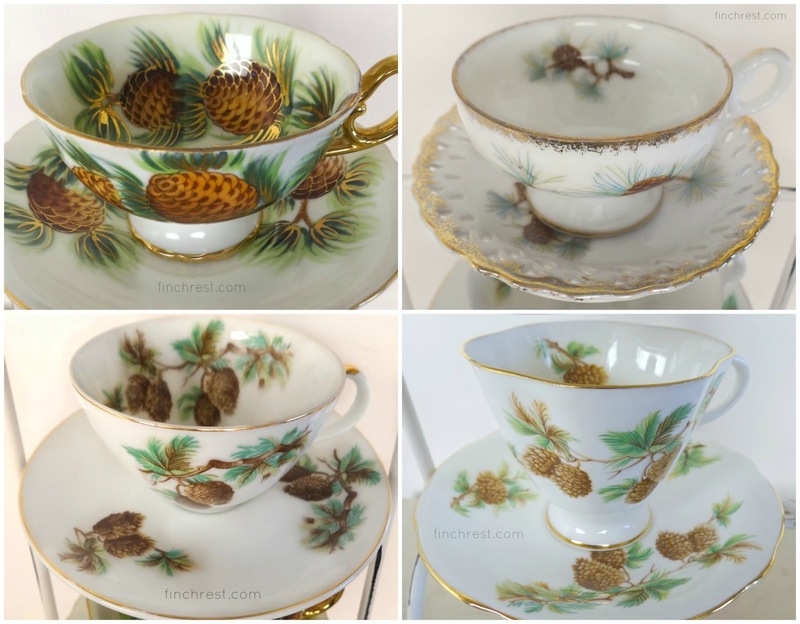 Michele, Pinecone teacups is a nice collectable. The waterlogue painting looks great. Love the salt cellar and the small green teacup. Thanks for sharing. Sylvia D.
What a beautiful post, Michelle. The Scrabble tiles in the silver dish are so pretty - something I may emulate, if you don't mind. Winter is a beautiful season, isn't it? 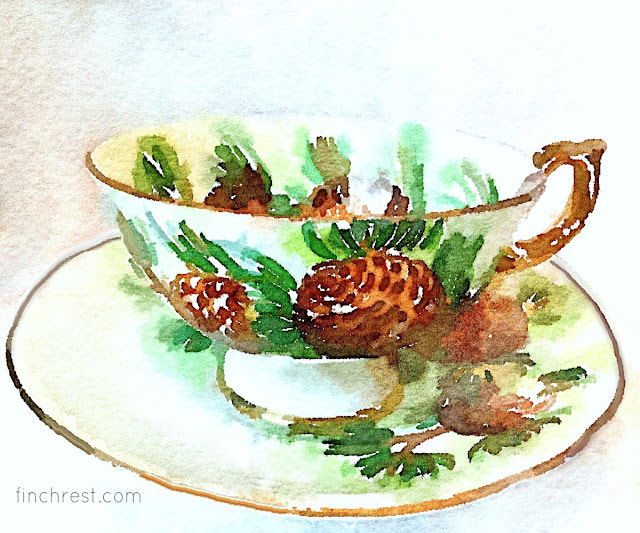 I keep saying I need to remember to get waterlogue...but...Love all your pinecone teacups. There aren't a lot of them around, don't know why! 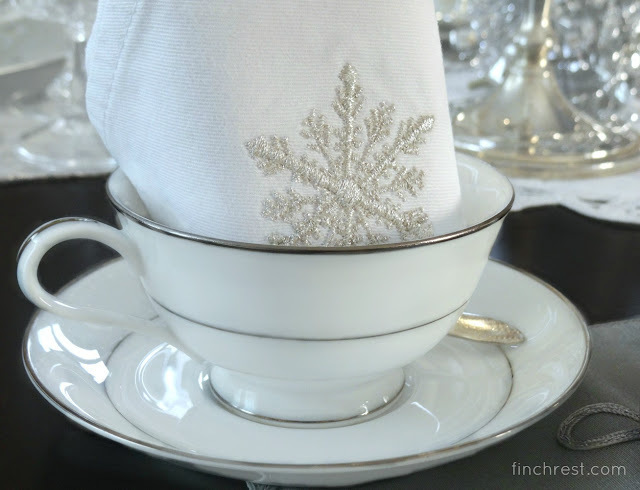 Your teacups and silver snowflake napkin is such a pretty vignette! And I love your Downton ornament! Happy New Year and thanks so much for linking to Tuesday Cuppa Tea! I enjoyed seeing all your treasures today! The DA ornament is really exquisite and I love your pine cone tea cups and the cute stand you have to display them. I'm always picking up pine cones on my walks and they are displayed all over my house. I fully understand the need to downsize. I moved cross country from NY to Colorado four years ago and that move taught me a lesson to not collect too much in the future! I try to keep new decorations at a minimum but I do love each one I've had for many years that hold memories. Your pinecone teacups are lovely! I also like the cloth with an embroidered snowflake. Hi Michele! I'm still enjoying this pretty post. That little bird holding the spoon is adorable. Thanks for popping in to see me and you sweet comment! Hope you're having a nice weekend.